Motorized Model Fun -- A colorful mixture of flexible and hard plastic parts, this set is ideal for builders who have mastered the basics. 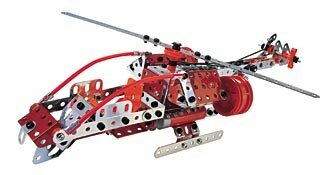 Motorized for motion, this set allows you to construct cars, helicopters, machines, and more. The 352 parts included can build at least 30 models. -- When you add other erector sets, you can use the parts interchangeably to build an infinite number of models. Includes an Allen wrench, multi-function box-end wrench, cable command, and 6V battery-operated motor. Recommended age range from 8 years and above. -- WARNING: Choking Hazard - Small parts. Not for children under 3 years.